Everyone knows that water is one of the healthiest drinks for the human body. It provides hydration, clears up acne, lubricates and cushions the joints for your body, and delivers many more benefits. Water makes up 60% of the body’s weight—it can also play an essential role in controlling your appetite and helping you lose weight if you drink water at the right time. For example, did you know that it’s beneficial to drink a glass of water before you go to bed? 1. Restoration: Drinking a glass of water before bedtime will help the body restore the fluids it lost throughout the day. Because more than half of your body is made up of water, you will need to maintain hydration in order for this to work. Because the body is not working as hard when you sleep, it doesn’t need to release as many fluids. 2. Burning calories: Drinking a glass of ice cold water is a beneficial way to burn calories and help with weight loss. When you drink cold water, your body needs to work harder to warm itself up; hence, it increases the rate at which your metabolism burns calories. If you drink a glass before you go to bed, your body will be working even harder to keep itself warm, and because you are not consuming any extra calories when you sleep, your body will burn excess calories while you sleep. 3. Balance: When you consume water, you are balancing your body’s nutrients, vitamins, and minerals. When you consume a glass of water before bed, your energy levels, hormones, muscles, and joints become balanced. This will ensure that you are fully rested in the morning. The reason being is that when you are sleeping, the nutrients from the water have more time to reach every part of the body to replenish the nutrients lost from the past day. 4. Cleansing: Water is one of the best ways to cleanse your body. Throughout the day, your body attracts various toxins from the environment, food, and other elements. Cleaning out the toxins on a consistent basis will keep the body healthy and functional. Drinking a glass of water before bed will give your body the proper nutrients and time to clear the system of unneeded toxins. Your skin, digestive tract, and muscles will all benefit from this cleanse and you will find yourself with an extra boost of energy when you wake up. If you suffer from kidney or heart problems, drinking a glass of water before bed is not recommended. This increased intake of water will put extra pressure on the kidneys, which are already weak in this case, and they won’t be able to properly remove the fluids from the body. Drinking water before bed can also disrupt your sleep. You may have to wake up throughout the night to use the washroom. 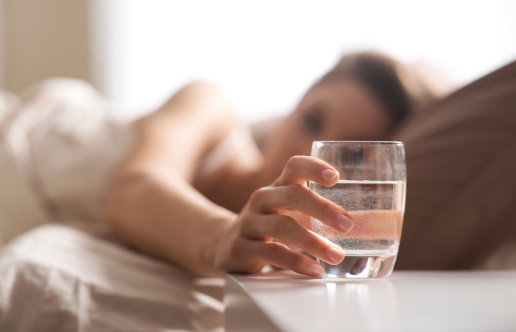 If you are the type of person that does not function well the next day without a proper night’s sleep, take precautions before you drink a glass of water before bed. For example, try to drink a glass of water about two hours before bed. You should also try to go to the washroom before bed so your sleep won’t get disrupted. Before a meal: If you consume a glass of water about 30 minutes before your meal, it helps prevent overeating. It keeps the liver lean and stimulates your bile production. When you’re sick: Your body becomes dehydrated when you come down with a cold or flu. Consuming six to eight 8-ounce glasses of water a day is good for the body. When you wake up: Your internal organs get activated and are ready to begin the day when you consume water as soon as you wake up. Any remaining toxins should get flushed out before you eat your first meal. While exercising: By drinking water either during or before you exercise, you reduce your chances of becoming dehydrated, and also put less pressure on the liver to clear out the toxins from your body. When you are tired: If you are tired, try drinking a glass of cold water. It will keep the body alert because water is absorbed quickly and moves even quicker through your body. When you are around people who are sick: If you are surrounded by people who are sick, drink water and stay hydrated to flush out any harmful toxins in the body. Try sipping water throughout the day to keep your body hydrated and your stomach full—this should help with weight loss. If you are struggling with controlling your food intake, in addition to the eight 8-ounce glasses of water you should be drinking, try consuming an additional two glasses before each meal. Furthermore, for each meal, try to include plenty of non-starchy vegetables and fruits, such as melons, tomatoes, and celery—all which are between 85 to 95% water. “Drinking Water before Bedtime,” WaterCoolersDirect.com, May 23, 2013; https://www.watercoolersdirect.com/drinking-water-before-bedtime, last accessed September 10, 2015. Braverman, J., “Will Drinking Water Before Bed Help You Lose Weight?” SFGATE web site; http://healthyeating.sfgate.com/drinking-water-before-bed-lose-weight-12221.html, last accessed September 10, 2015. “Are There Benefits to Drinking Water Before Bedtime?” FitDay.com; http://www.fitday.com/fitness-articles/nutrition/healthy-eating/are-there-benefits-to-drinking-water-before-bedtime.html, last accessed September 10, 2015.